Pamela Peeke, MD, MPH is a clinical assistant professor of medicine at the University of Maryland School of Medicine and a Pew Foundation Scholar in Nutrition and Metabolism. Dr. Peeke is a medical commentator for CNN, and has appeared on Oprah, Larry King Live, The View, The Today Show, Dateline, PrimeTime, and others. She is the Chief Medical Correspondent for Nutrition and Fitness with Discovery Health TV. Dr. Peeke regularly contributes to numerous magazines and is medical director for the National Women's Health Resource Center. Author of numerous books, her bestselling, Fight Fat After Forty, presented groundbreaking research describing how chronic stress contributes to weight gain and threatens the length and quality of life after the age of forty, Dr. Peeke has become known as the scientist who first presented the scientific basis of the "stress-fat" connection to the American public, raising awareness about this potentially life threatening medical condition. 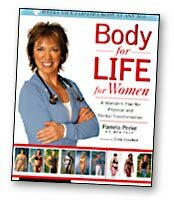 Dr. Peeke's newest book is Body for Life for Women: A Woman's Plan for Physical and Mental Transformation. Peeke says, "Women are up to their ovaries in stress" as they try to care give everyone in their lives. Women are psychologically hard wired to make their quest for self care even more difficult. Peeke's experience in working with women of all ages proved to her that women have unique female traits that prevent them from keeping both physically and mentally fit. "I knew from my practice that the most successful plan for today's women would factor in the realities of a woman's whole life - the full-time job, the endless caregiving, the stress that comes with trying to do it all. And, most clearly of all, it would address the issues of emotional eating and poor body image-issues with which many women struggle on a daily basis. The dieters accepted failure and kept on trying. The dieters were not totally restrictive of favorite foods - they indulged from time to time. They exercised one hour per day. They added extra activity into their daily routines. They ate 5-6 meals a day and did not skip breakfast. So apply the tips above to your own journey and remember it all starts in the Mind: BELIEVE--ACHIEVE--SUCCEED! Here's one more reason to make sure you're consuming an abundance of Smart Carbs, that is those plant-based foods that are as little processed as possible. And by this we're speaking of the wonderful world of fruits, vegetables, legumes and grains. You already know it's wise to avoid white-flour/white-sugar foods like the plague! They offer up little solid nutrition, are often high in fat, and provide little dietary fiber. This newest reason comes from a recent study has found that eating a low-fat diet packed with nutritious vegetables, fruit, beans and whole grains reduces levels of "bad" LDL cholesterol twice as much as eating a low-fat diet that's heavy on prepackaged foods. The study appeared in the most recent issue of the Annals of Internal Medicine. Half the test group followed a low fat diet that included large quantities of plant-based foods: vegetables, fruits, legumes, especially soy, whole grains, and limited meat and dairy. The other half followed a low fat diet that included packaged foods like reduced-fat cheeses, lunch meats, frozen dinners, diet soda, and fat-free cookies. Researchers described the second one as a more typical low fat diet followed by Americans. So before you assume that the only way to lower your high cholesterol is to begin a regimen of medication, which may result in serious complications, consider the advantages of cleaning up your diet and ramping up your activity level. Several additional benefits may be had from a low fat, Smart Carb approach: lowered risk of hypertension, diabetes, and several cancers including breast, prostate, and colon. Be assertive with your doctor about your desires and make an appointment pronto with a registered dietitian to fine-tune a plan of action to improve your health. A recent study at the University of Colorado at Boulder has determined that if you are fat, it doesn't matter if you are fit. Which isn't to say that there is no reason to build your fitness base as you remove weight, but rather that you shouldn't view physical activity as a substitute for achieving a healthy body fat range. "Despite how fit you are, being an overweight or obese man exposes you to elevated risk factors for cardiovascular disease," stated study author Dr. Demetra D. Christou. The study involved 135 healthy men, aged 20 to 79. Some men had been exercising vigorously for a significant period of time, others were recreational athletes, and a third group were not at all active. There were lean and overweight individuals from each group. The researchers found that body fatness, rather than aerobic fitness, was the strongest predictor of cardiovascular disease, as measured by 18 risk factors including cholesterol, triglycerides, fasting insulin, and blood pressure. The study has implications for both active men (and women), as well as couch potatoes. If you are overweight or obese, you need to shed the fat no matter how active you are. And if you are sedentary, you have even more reason to improve your aerobic fitness. Americans would do well to heed the recommendation of the latest US Dietary Guidelines about physical activity: to achieve 60 to 90 minutes each day! Read LAST WEEK'S Transcript with Pete Hueseman, R.Ph., P.D. Pete Hueseman, R.Ph., P.D. and The Women's Active Multi Vitamin contains every vita-nutrient a midlife woman needs. To unsubscribe from our mailing list, please see the instructions at the bottom of this email. *FORBES Magazine: "Best of the Web"